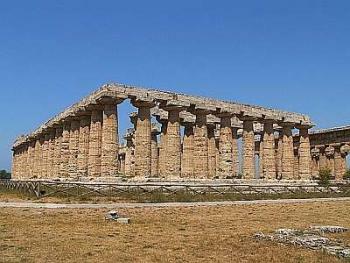 A short drive south of Naples will bring you to Paestum. There you have the opportunity to visit one of the most prominent and easily accessible of the sites in Italy that, along with Cuma, Elea (Velia) and many others here in the south, made up Magna Grecia, that magnificent extension of Classical Greek civilization beyond the waters of the Aegean half a millennium before Christ. The ruins of Paestum that you see today as you drive along the length of SS 18 about fifteen miles past Battipaglia give only the faintest idea of what a great Greek city in those days must have been like. First of all, the area is known—from the discovery of pottery fragments—to have been visited many centuries before even the famous Greek city-builders by travelers from as far east in the Aegean as myth-shrouded Troy. Certainly the Mycenaean Greeks must have been among these. In any event, when it came time for Sybarite settlers—from Sibari, another Greek colony to the south near modern-day Taranto—to seek greener pastures, they chose the shores of southern Italy at a point where the Sele river flows into the Tyrrhenian Sea, the southern part of what is today called the Gulf of Salerno. Before the Sybarite Greeks arrived, the area was home to an indigenous people known as the Enotrians. (Their main settlement, named Tempalta by archaeologists, was 14 km. to the north of Paestum at the mouth of the Sele.) It isn't clear whether the Greek takeover of the area was peaceful or violent. The Greeks founded their city on this fertile plain in around 600 BC. and named it Poseidonia (after the Greek god of the sea, the Roman "Neptune"). They didn’t seem to mind the total absence of any nearby high ground on which to build an acropolis, the "high city" typical of so many other Greek settlements. Perhaps the mythology and aura of magic already linked to the area was a factor in their decision. Here they built a city, relying on megalithic walls for defense. The walls were three miles in circumference, and, indeed, at least the massive lower portions of the walls are still intact around much of the perimeter; as well, the ruins of the four gates are still visible: Porta Aurea, Porta della Giustizia, Porta della Sirena, and Porta della Marina. Entrance to the vast archaeological site is directly from the main road, SS 18. There are a number of exits marked "Paestum" leading to various sections of the new town as well as the archaeological site just a few hundred yards to the west, between the road and the sea. The most obvious ruins to be seen are those of three large temples. The southernmost one is the Doric Basilica; it was probably dedicated to Hera, wife of Zeus and queen of the Gods; there is a sacrificial altar in front of the temple. 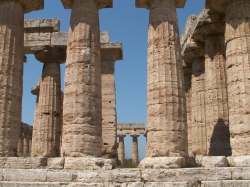 Next to this temple stands the so-called Temple of Poseidon; its simply-fluted, heavy columns are the best preserved examples of classic Greek Doric architecture left in the world, including ruins in Greece. The third large temple left standing is the one erected to Ceres. All three of these are from the sixth century BC. nearby Temple to Hera at the Mouth of the Sele. Perhaps because of its lack of strategic terrain, Poseidonia had a relatively short history as a Greek city. It carried on commerce with the great Etruscan cities of the north, but then in the fourth century BC was conquered by the Lucanians, one of the indigenous Italic peoples of the peninsula and the one whose name this region, Lucania, still bears. The Lucanians are referred to by Strabo as a "Samnitic" people. If they really were Samnites, even distant cousins, then they were no doubt nasty and belligerent, but like everyone else at the time in Italy, they too were gobbled up in turn by the mighty Romans. The Romans strengthened the walls of Poseidon—Paestum, by then— and added baths, more temples and an amphitheater, turning the place into a typical Roman outpost of luxurious sybaritic self-indulgence. (That was nice, since Sybarites had founded the city in the first place.) In any event, though less conspicuous than the Greek temples, there are significant Roman ruins to be seen as you stroll across the wide abandoned meadows of Paestum. The entire area today shows remnants of not only the Greek walled city of Paestum and later Roman ruins, but other smaller sites such as shrines and necropoli outside the walls; some are Greek and Roman, but some are Lucanian; and some appear to be Enotrian. 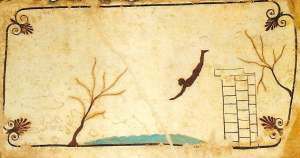 That's not all: the famous Tomb of the Diver has figurative art on the inside of the tomb, showing a man diving into the water (image, right). It is the best-known example of tomb slab painting in Paestum and part of the site's great treasure trove of ancient fresco paintings. It is my understanding that that type of tomb ornamentation is not Greek but Etruscan. There are just enough such Etruscan morsels lying around in Paestum to make archaeologists smack their lips, so who knows. Indeed, in the centuries after the fall of the Roman empire, Paestum was also invaded by nature, which turned the plain into an on-again, off-again swamp. It was even overrun by Saracens, the fierce Muslim pirates from the south who raided along these coasts in the eighth and ninth centuries AD. Truly, the site must have been mysterious over those centuries; it is anyone's guess what travellers who stumbled across these ruins in the Middle Ages must have thought. You didn't have to be an unlettered peasant to be awed by these temples. 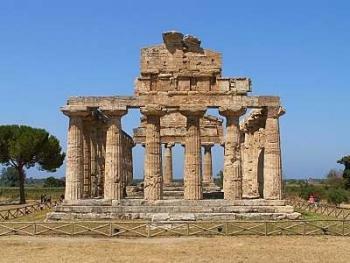 There is a mention of the area of the temples in Paestum by Neapolitan humanist, Pietro Sommonte, as early as 1524, but the great Spanish Empire, of which Naples had become a vice-royal appendage, was not particularly interested in finding out about and preserving exotic and little-known cultures. (Ask the Aztecs!) As a true archaeological site, Paestum is scarcely a few centuries old, having been rediscovered in the early 1700s along with Pompeii, Herculaneum and so many other relics of Classical Italy. Yet Paestum was more interesting to many in the mid 1700s than those two famous examples of rediscovered Rome right next door on the slopes of Vesuvius. 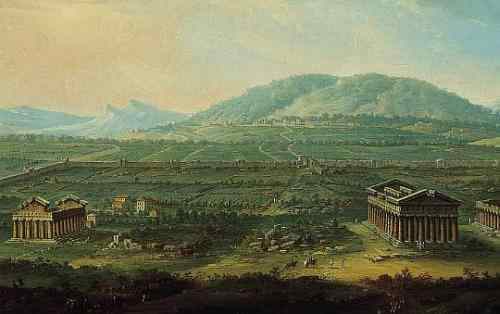 Even back then, people knew what Pompeii and Herculaneum had been, even if modern archaeology had not yet arrived on the scene, but Paestum was special and mysterious. The first maps of the site appear in 1732, and between 1734-40, with the new Bourbon dynasty under King Culture, himself, Charles III, firmly in charge of the Kingdom of Naples, an entire set of drawings of Paestum was published. By the 1750s, Grand Tourists were on to the place. Numerous English “amateur” archaeologists (in real life, they were “gentlemen”) were sending back lengthy accounts of the ruins of Paestum. (See: “Documents on the Greek Revival in Architecture,” by Michael McCarthy, in The Burlington Magazine, Vol. 114, No. 836. Nov. 1972, pp. 760-769.) Somewhat later Goethe waxed so Romantic over it all that he had to send back to Frankfurt for more wax. There is a fine modern museum right across from the main entrance; it contains the obvious Greek and Roman relics, but also a considerable collection of prehistoric items from the area. 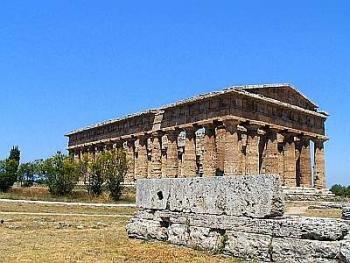 The museum was built in 1952 at a time when the modern town of Paestum was very small and not much of an attraction. The explosion of the tourist business in the Gulf of Salerno in recent decades has changed all that. There is a great deal of recent, attractive residential housing and any number of hotels geared to tourists, who themselves are geared to the beaches and the archaeological site. With all that, the museum has come into its own as a singularly good one.